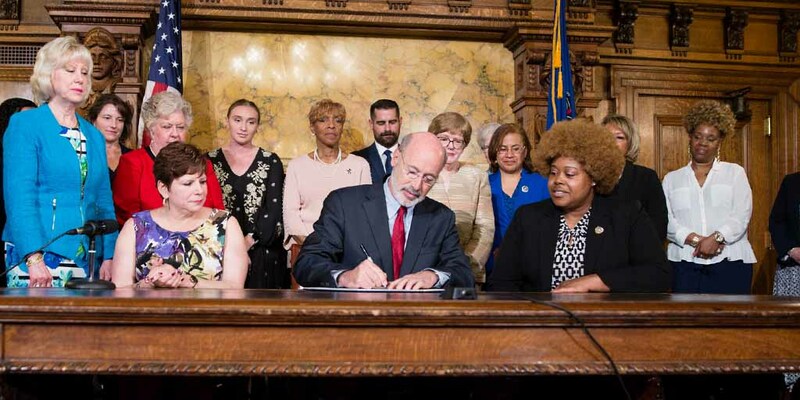 Harrisburg, PA – With Pennsylvania women still paid significantly less than men for the same work, Governor Tom Wolf today took action to address the gender pay gap that hurts women, families, and businesses. Joined by First Lady Frances Wolf, Sens. Christine Tartaglione and Judy Schwank, Reps. Maria Donatucci and Brian Sims, as well as the Pennsylvania Commission for Women and other advocates, Governor Wolf signed an executive order ending the practice of state agencies requiring a job applicant to provide their salary history during the hiring process and called on the General Assembly to pass similar protections for all working women in Pennsylvania. “The gender wage gap is wrong,” said Governor Wolf. “It’s wrong for women, wrong for families, wrong for business, and wrong for the economy of Pennsylvania. This executive order begins to end this discriminatory practice, so that women hired by the commonwealth are paid what they deserve, and the wage gap does not follow them to a state job. The Executive Order, which applies to management-level positions, takes effect in 90 days. The governor was joined by several legislators who are sponsoring legislation to strengthen Pennsylvania’s equal pay law protections to prevent private sector employers from requiring job candidates to provide their salary history or paying less based on gender, which perpetuates the wage gap. “We must support efforts to recognize the equal value of work without regard to the worker’s gender, and especially to uplift the many families, and many female-headed households, whose livelihoods and welfare depend on the pay earned by women,” said Sen. Judy Schwank. Women working full time, year-round in Pennsylvania are paid just 79 cents on the dollars of what men are paid, a gap of 21 percent, worse than the U.S. wage gap of 20 percent. Pennsylvania ranks 29th out of the 50 states for pay disparity, and fifth among its seven surrounding states. That means Pennsylvania women need to work nearly 15 months for the same paycheck a male worker earns in just a year. Wage discrimination has real consequences for women and their families. The financial hit costs women thousands of dollars a year, and over a career, women earn $1 million less than men, according to the American Association of University Women. The pay gap makes it harder for women to buy homes, pay for college, and care for their families. Today, 42 percent of mothers are the primary breadwinners of their families. The wage gap starts when women begin their careers. One year after college, women earn 7 percent less than men with similar jobs, education, and hours worked.